On Monday I had an errands at Pinewood. Pinewood? Yes, the minor shopping centre somewhere on Blackburn Road between Clayton and Mount Waverley. I caught the bus up there — the 703 runs from near home in Bentleigh, via Monash Uni, then up Blackburn Road. 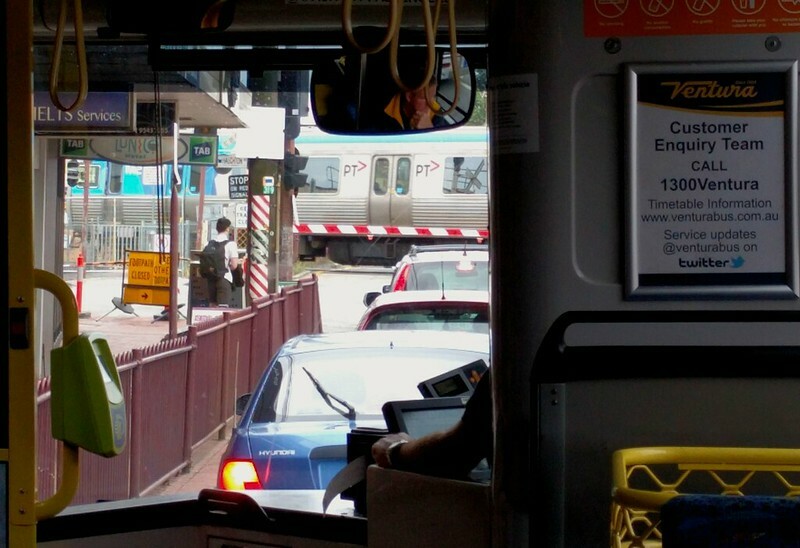 Unsurprisingly perhaps, we had to wait at the Clayton level crossing for a train… thankfully only one train; it’s common for long delays here, though this was after peak hour. After my errand, I decided to walk back part of the way. 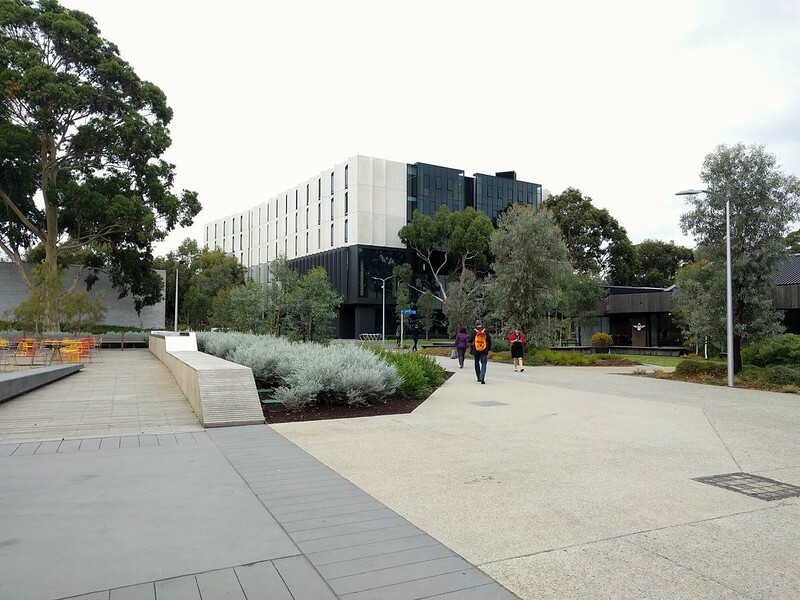 It was only about 3km to Monash Uni, and the weather was cool and dry — perfect for walking. Good to try and get to my daily 12,000 step goal. As with my travels during holidays and short breaks, I snapped a few photos, and tweeted a bit as I went. Always an opportunity to observe and learn. Later on I was asked if I’d be blogging it, so here goes. 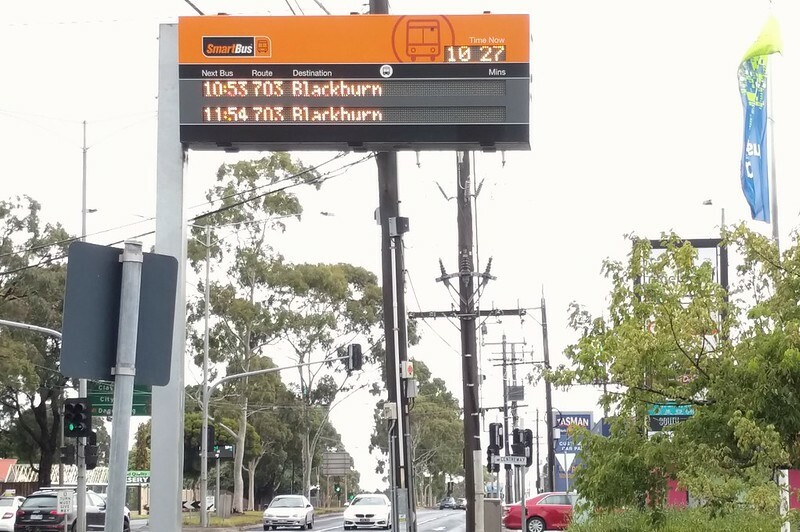 There was a PTV outage of realtime bus info that day. It seemed to affect the apps, the Next Stop announcements and displays inside the bus, as well as real-time Smartbus signage. Apparently it took until sometime on Tuesday to get it resolved. For a short time in the 90s I recall working in this office block. My view is it’s not a beautiful location, surrounded by car parks. The problem with suburban office blocks is not just that the PT is often woeful (or certainly inferior) but there’s few options within walking distance to eat lunch or go shopping at lunchtime. No doubt some people like that it’s a drive-able commute, but I definitely prefer working in the CBD. Slip lane for vehicles exiting the Monash Freeway turning northbound onto Blackburn Road. 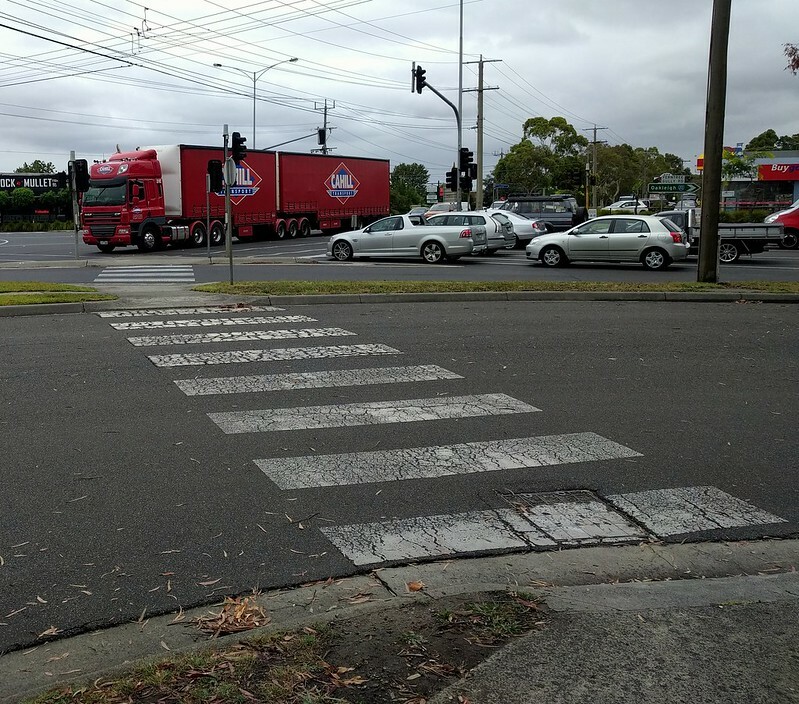 Most of slip lanes have zebra crossings. Not this one. It’s actually the law that vehicles must give way to pedestrians here, but as a pedestrian, I’d never assume that motorists actually know this. Pedestrian signal button at the same location. Too bad if you’re mobility-impaired and can’t navigate off the path to press it — or if there’s a huge muddy puddle in the way. 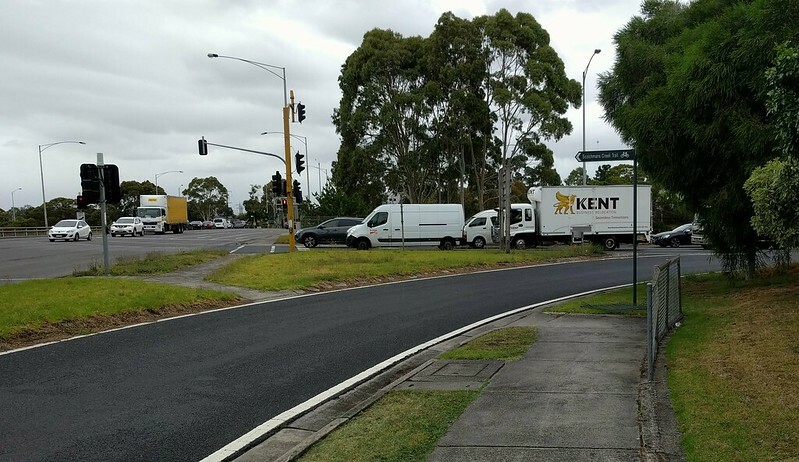 Blackburn and Ferntree Gully Road intersection. Lots and lots of traffic lanes. You get a zebra crossing to get over the service road, and another to get across the slip lane. Then you have to wait for the other six lanes of traffic. Ferntree Gully Road outside the Monash waste transfer station. Not a friendly pedestrian environment. 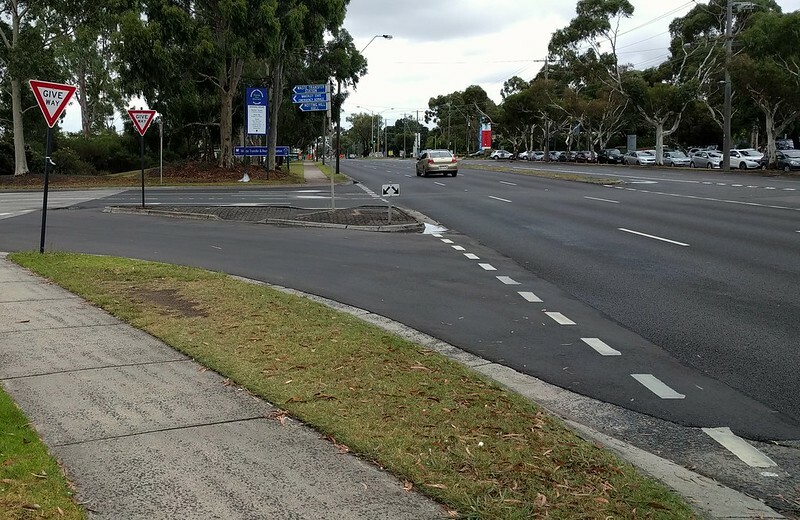 You’re expected to veer left then right to cross… the visible desire line looks like many people don’t. I’ve often wondered what the point of these narrow bus bays is. It’s awkward for the bus to pull in, and it still blocks the traffic lane. Why bother? 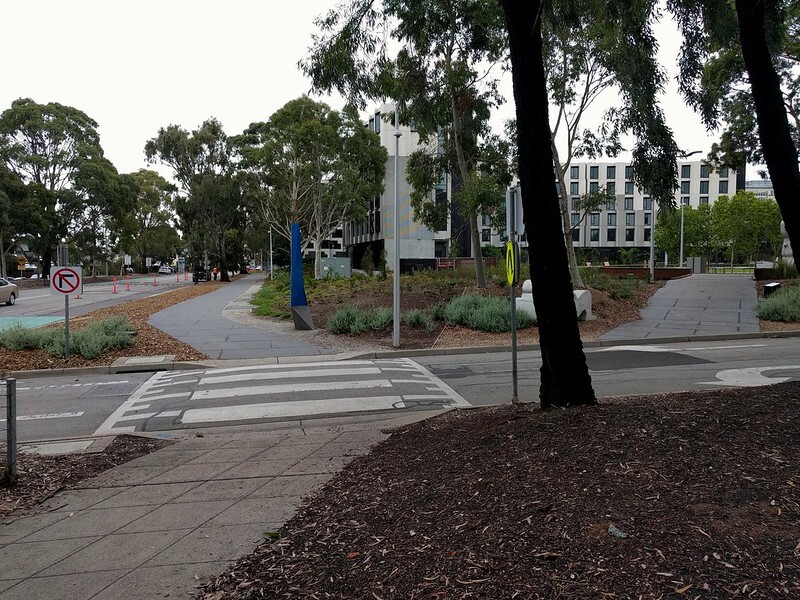 The northern entrance into Monash Uni Clayton campus isn’t beautiful, and the giant roundabout is difficult to navigate as a pedestrian. It’s called “Scenic Boulevard”… perhaps that only applies if you’re in a car. To be fair, it’s probably got little potential as a principal route for pedestrians. As you go further through campus, the pedestrian environment improves, particularly the paths from the student accommodation to the main part of campus. This is a curious design though. The busiest path to the right misses the zebra crossing by a few metres. 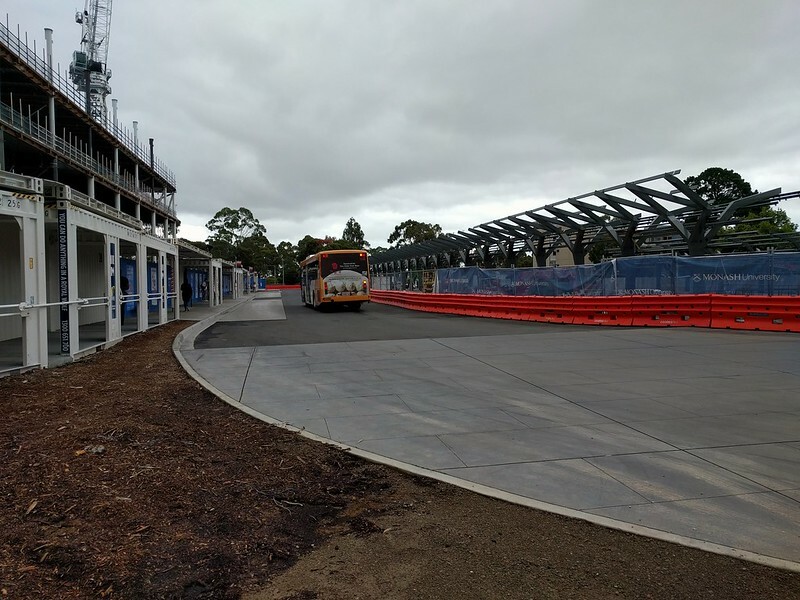 The new Monash University bus interchange is under construction. Hopefully it will provide better cover. So much for the bus loop we all know and love. Waiting for the 601 shuttle to Huntingdale station. The bus is so frequent that it made me wonder if anybody reads these timetables. It might be more useful to just have a frequency guide. Locals say it doesn’t really stick to time anyway — after all, for a service like this, maintaining frequency is more important than specific times. Being outside semester, those times didn’t even apply. A reduced service runs: every 12 minutes… to meet a train running most of the day every 10 minutes. Yeah. I was taking a phone call at the time (ironically from a public transport bureaucrat) so I didn’t get a photo, but the bus was pretty busy, with most seats filled. On campus I’d run into a contact and his colleagues, and one of them told me the 601 bus suffers greatly from overcrowding in first semester, when all the students come back. Monash campus numbers are increasing… sounds like the bus needs a boost too. 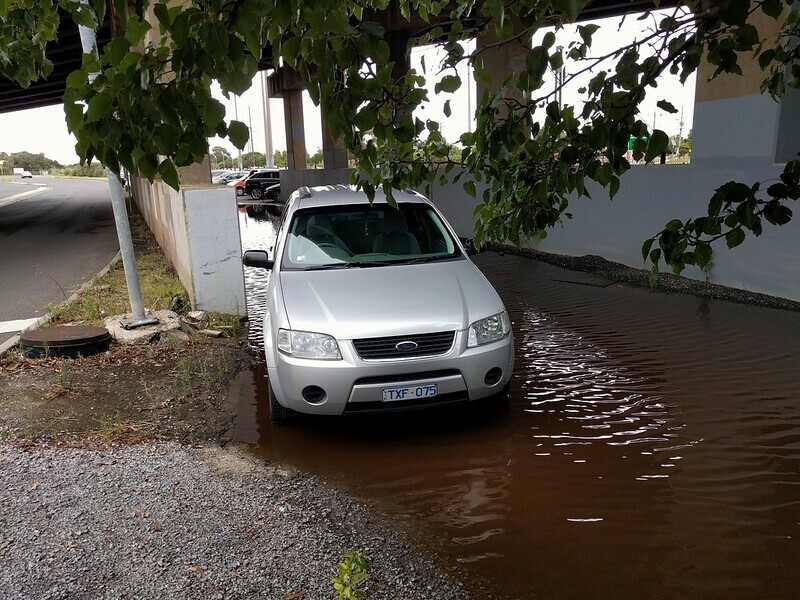 Rain the previous day had put parts of Huntingdale station car park under water, but it didn’t seem to bother some people. After all that walking (and more later), I didn’t quite reach my 12,000 step goal that day — only 11,171 according to my phone. Oh well, not for lack of trying. Ah, the Howleys Rd deviation. Route 693 used to do this about twice a day in an apparent attempt to serve Monash Uni and the industrial precinct. I used it a couple of times because when you timed it right to get that happy coincidence it was actually faster than via Huntingdale. But with just a handful of deviations per day it was never going to be popular. One more for the ‘designed to fail’ file. Something else to think about regarding the ‘Scenic Boulevard’ route. 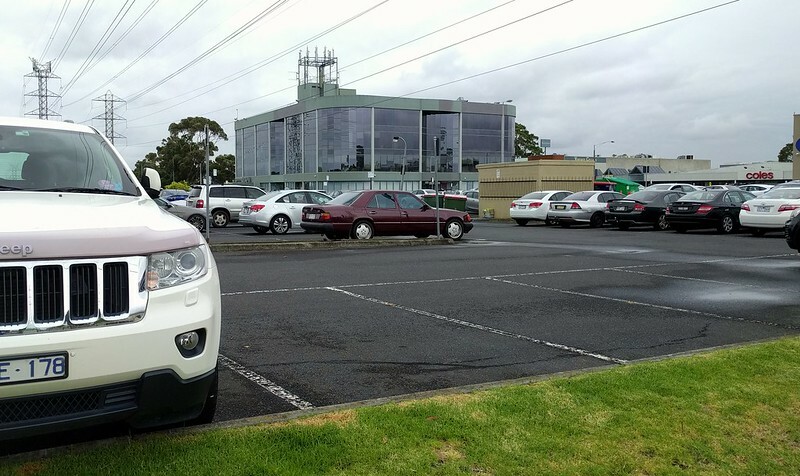 The Monash Uni engineering school is on the north end of the campus; CSIRO is directly over the campus ring road from there (but is appallingly pedestrian hostile); and major electrical equipment manufacturers such as ABB are nearby in Blackburn Road. The entire area is something of an engineering technology hub. I’ve had cause to do the walk from Monash Engineering to ABB several times – it’s doable but not well provisioned to say the least. There is so much potential to open up the area to support greater academic/industry collaboration, but currently it appears designed to discourage interaction. Just a quick note from an engineering student at Monash. 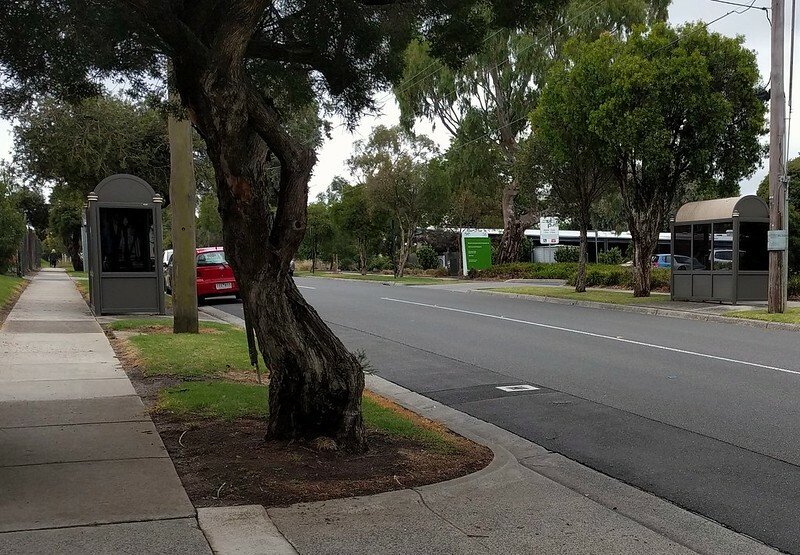 That small road near the new student accommodations is in plans to be upgraded to a pedestrian walkway once the new building on the carpark adjacent to that road is built. But having completed some traffic units in my course, alot of the traffic professors see the cycling and pedestrian infrastructure on the outer ring road as pretty poor, using it as bad practices in lectures. @Tony, it seems the 693 deviation was replaced by the 742 deviation. It doesn’t run down Howleys Road, but does have a mightily confusing double deviation – most services between 8am and 7pm go via Scenic Blvd and the university, but a few per day run via Normanby Road instead… perhaps because they want to stop somewhere near the uni, but the uni gate is closed? Logic would suggest that instead the gate hours be extended or they find some other way to let the bus run through until end of service. One of the lessons I recall from seeing other routes occasionally miss their twice-a-day deviations is that bus drivers are human, and sometimes forget to divert. And check the map for the 742 – the time point they’ve used for the Normanby Road deviation is actually on the route for the university deviation! Confusing at best… and the eastern section of the route into Ringwood is a masterpiece of zig-zagging. 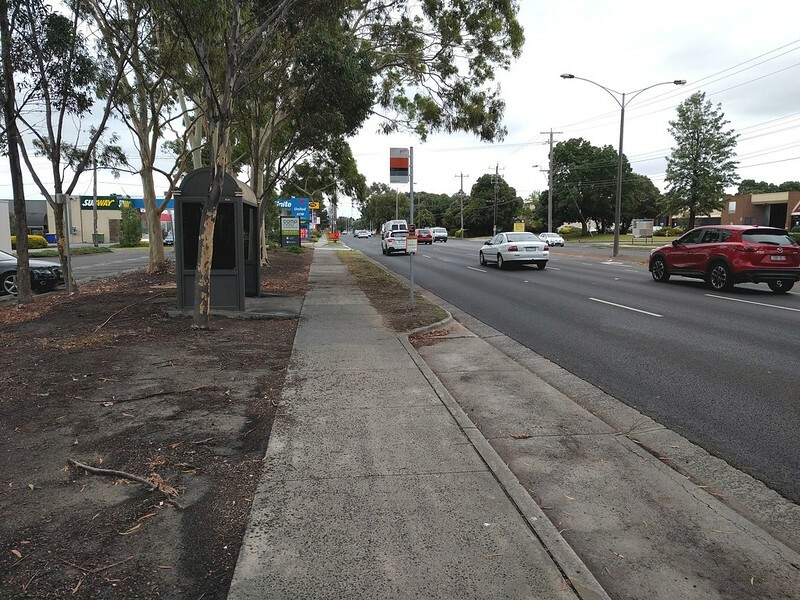 I notice that those bus shelters are accessed via the footpath, not the roadside, with the seats (presumably) facing away from the road? 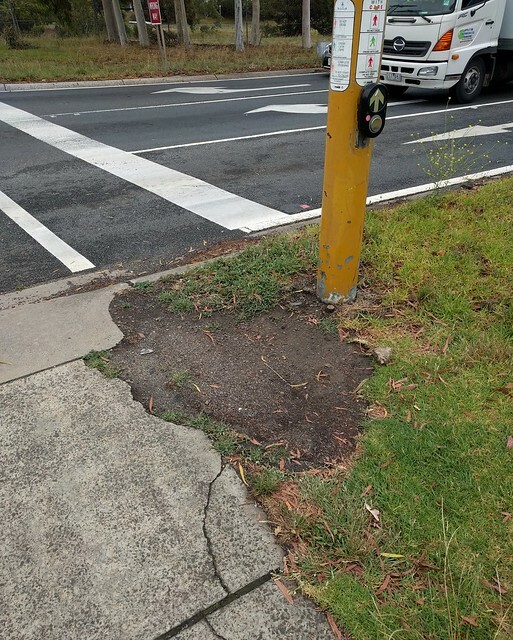 If I’m going to use a bus shelter I need to be able to glance at the road to see if the bus is coming and make sure the driver can see me, or it’s simply useless. @Nick, actually both bus shelters have their open side to the right (facing east), presumably to better protect against the weather. The middle section is tinted glass (or something tougher, probably)… you’d probably be able to see if the bus is coming, though perhaps not vice versa. Can confirm that the 601 does not run to timetable. It almost always leaves as soon as the next one approaches during the semester. I think I saw you mention on Twitter that it’s over-capacity. That’s true, but neither does it really matter for a quick bus trip & a high-frequency. The only potential issue I can see are for people with mobility issues. I think having more services on that route, rather than the suburban routes where you could make more of a difference, would be a real waste. 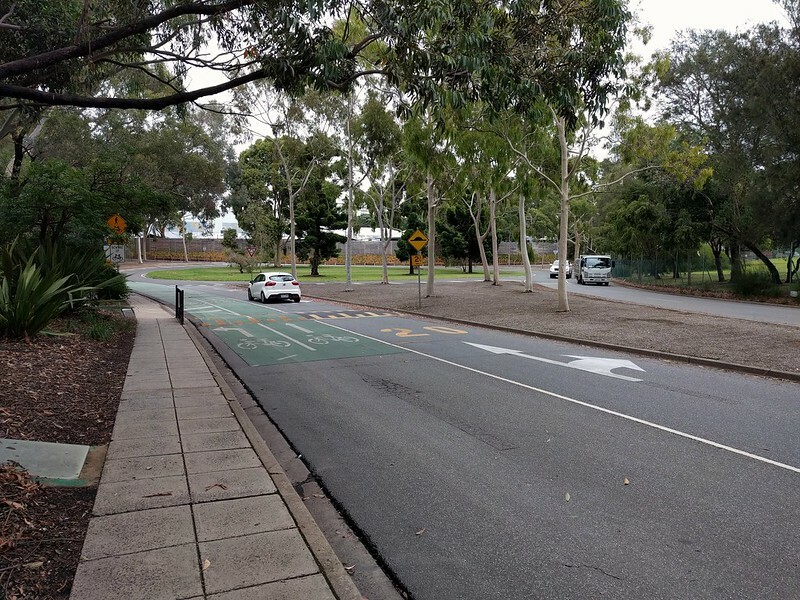 There was a lot of work done on campus, some of which improved its walkability, particularly just north of campus centre and around the new student accommodation. The street-address system was certainly an improvement in navigation (as much of a pain it was to get used to – remembering building numbers is easier than remembering a number and a street name). Has ‘Campus Centre’ really caught on as a name among the student body? If so, it looks like student unionism has vanished. I never thought I’d see the day. Not one of the activist students of the late 1990s would have called that place anything other than the union building. We recently had a tragic and preventable case where a slip lane killed two people in separate incidents, right beneath a TAC safety ad stating “No one deserves to die on our roads’. Slip lanes are well known as a design feature that causes death and injury, and which impairs mobility – only the brave and well feel confident enough to cross against the uncertainty and danger they create. Melbourne’s railway stations are due for a universal upgrade. 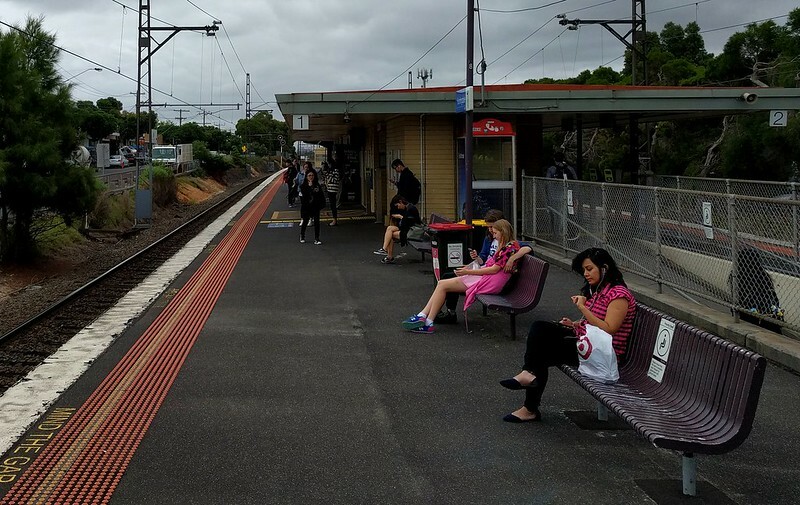 I was shocked when I used the Broadmeadows station on Monday, having been cossetted by the rather grand platforms in the inner-west. As a not infrequent user of the 742 via Monash I had no idea about the Normanby Rd deviation on evenings and weekends. I don’t recall the 742 doing this in the past, though it’s always run most daytime services via the Monash ring road. Maybe the uni does now close the northern gates outside business hours – though IIRC they only used to do this during the vacation period. 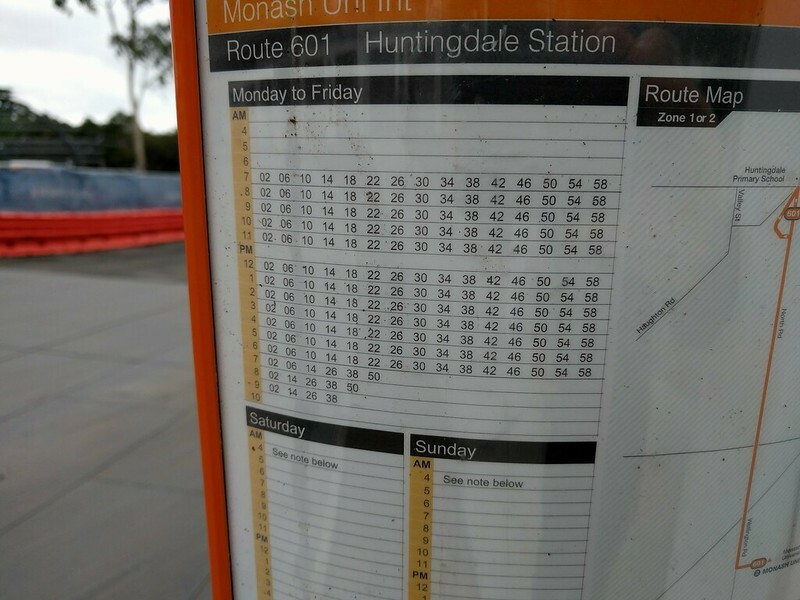 I can confirm that the 601 doesn’t operate to any fixed timetable at the Monash end at least: each bus just departs when the next bus arrives, which of course means the frequency is tied to the actual round-trip time (and arrivals at Huntingdale are still random rather than being synced to train departures). And B.A., running services over capacity does matter from an operational as well as a passenger perspective: it means you’re using valuable fleet and driver resources less effectively because buses spend more time idle than in motion. But it really is getting beyond the point you can effectively manage with buses – time once again to look at the rail extension. @Philip, it’s solely “campus centre” now, I haven’t heard ‘union house’ from anyone but staff who have been around for a very long time. I don’t think that has anything to do with the union, though. It’s perceived to be doing well from the student services side of things. Most people don’t care for its political/governance side, but I think that’s been the case for at least a number of decades now. The term “Student Union” became unacceptable during the Howard government, any reference to unions was removed from the facilities and it became the “Campus Centre”.